SUMMARY: The Narrows and White’s Branch Arch are unique because they are a rare arch with a road over it. The road was closed in the early 2000’s to vehicular traffic, and it is a fabulous hike. The descent to the arch is not marked and on an unofficial trail, but walking out on top of the Narrows provides great views and a nice official trail without even descending below. Natural Bridge, White’s Branch Arch and the Narrows are technically NOT in the Red River Gorge Geological Area, but rather in the Natural Bridge State Resort Park and the Kentucky State Nature Preserve. 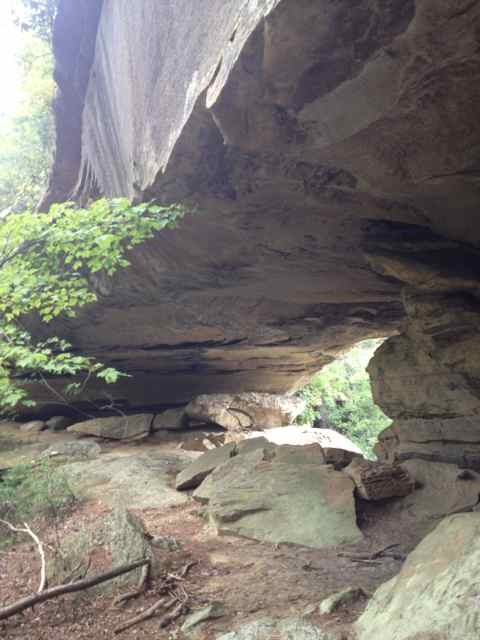 However, Natural Bridge State Park is probably the best known site in the area, and many people mistakenly think it is actually part of the Red River Gorge Geological Area. Because of Natural Bridge’s location in the state park special rules apply in this area such as the strict restrictions on pets, climbing, etc. 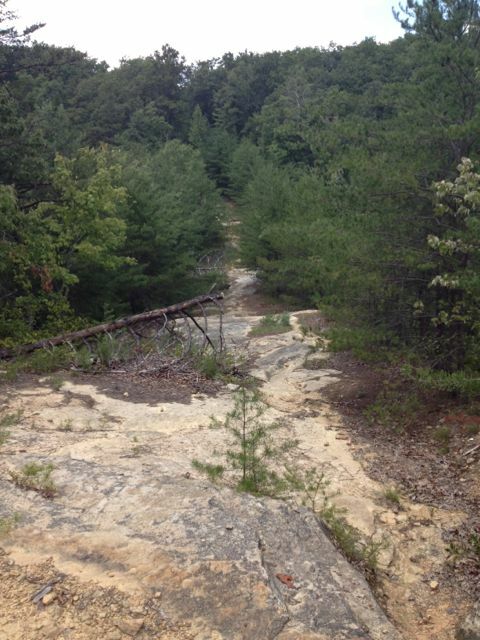 There are approximately 7 different trails plus a Skylift to reach the top of Natural Bridge. 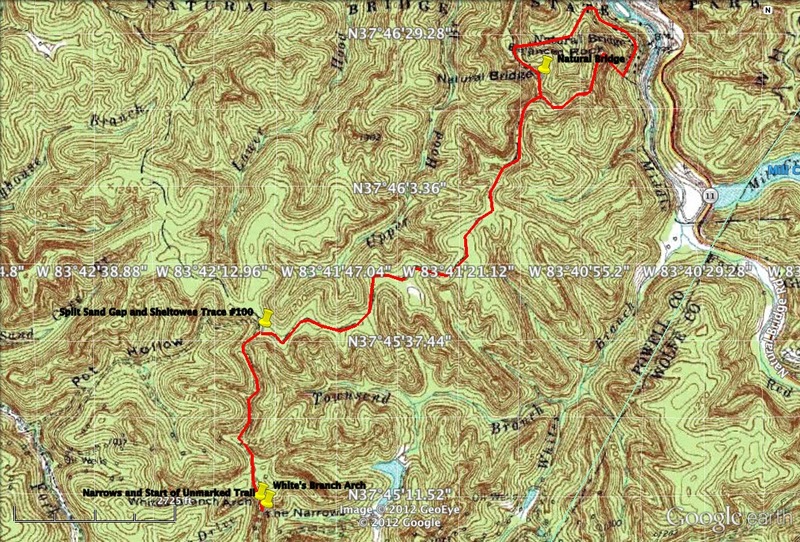 This route is one of the shorter and more popular routes to Natural Bridge and then to White’s Branch Arch and the Narrows. 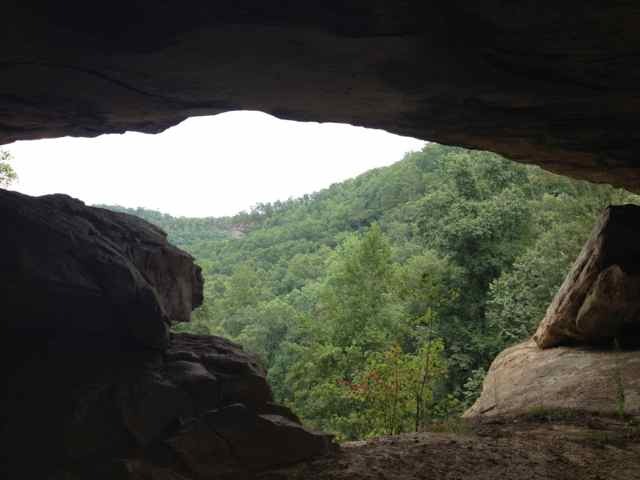 This route allows visitors to enjoy balanced rock, natural bridge and fat man’s squeeze. Enjoy the views from the top of The Narrows, and if you decide to descend to the arch make sure you are prepared as it can be extremely dangerous or deadly to leave the trail. RATING: Moderate hike (approximately 5.9 miles total.) This hike uses unmarked trails and many people have trouble navigating the hike. 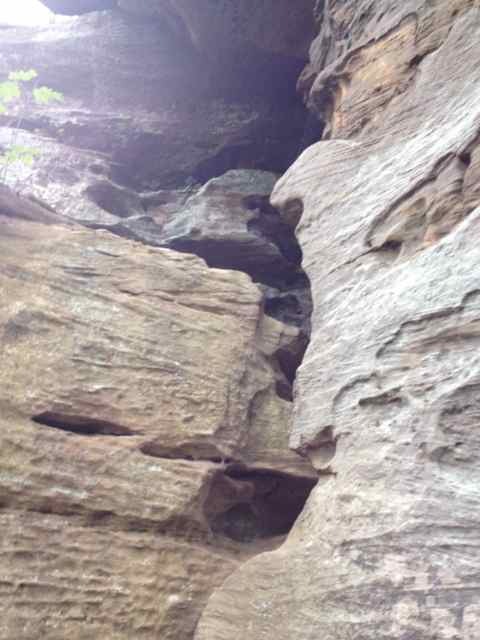 This hike has scrambles/climbs that can be dangerous or deadly. A quality map, compass and deep woods navigating skills are essential for your safety on this hike. AMOUNT OF TIME NEEDED: Allow a half of a day (3-6 hours) to enjoy this hike. Turn right and follow Trail #2 Balanced Rock Trail until it arrives just before the top of Natural Bridge (0.65 miles.) After 0.25 miles into the hike you will pass Balanced Rock (on left) an unusual rock formation where one rock appears balanced on the other.